New Delhi, 7th July, 2017: Ministry of Finance, Department of Expenditure has issued Office Memorandum of Revision of rates of Non-Practicing Allowance (NPA) in respect of Veterinary posts on 7th July,on the basis of the recommendations of the 7th Central Pay Commission. The decisions of the Government on the revised rates of various allowances based on the recommendations of the 7th Central Pay Commission and in the light of the recommendations of the Committee under the Chairmanship of the Finance Secretary, have since been notified as per the Resolution No.11-1/2016-IC dated 6th July, 2017. The revised rate of NPA in terms of these orders shall take effect from 1st July, 2017. 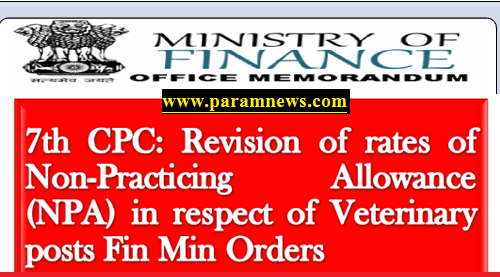 These orders will not be applicable in respect of Veterinary posts under the Ministry of Railways, Defence and Department of Atomic Energy for which separate orders will be issued by the concerned administrative Ministry/Department. Ministry of Finance, Department of Expenditure has issued Office Memorandum of Revision of rates of Non-Practicing Allowance (NPA) in respect of Veterinary posts on 7th July,on the basis of the recommendations of the 7th Central Pay Commission.